For business owners, the opening of their first branch office can be a huge milestone. However, as they embark on that new journey of adding more branches, managing IT across various locations can soon become a challenge. Discover four tips that can help your business beat the geographic gap. From considering the cloud and not forgetting about your perimeter to looking at different support systems, there are multiple ways you can manage your IT. And if you still need help managing your IT across different locations, reach out to us at TailWind, and we’ll be glad to help you find the IT infrastructure solutions your business needs to reach its goals. Managing IT across different locations can be a big challenge for businesses that don’t have the support they need to be successful. 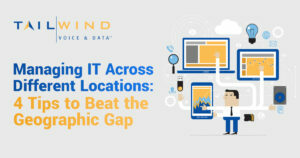 At TailWind, we have the IT infrastructure solutions that can help businesses beat the geographic gap. From standardizing to considering the cloud to looking at different support systems and using network monitoring and more, there are multiple ways to keep your locations in-line. If you need the help of certified technicians and engineers to provide vital expertise and guide you in managing IT, reach out to us at TailWind. We’ll be happy to help you reach your business objectives.